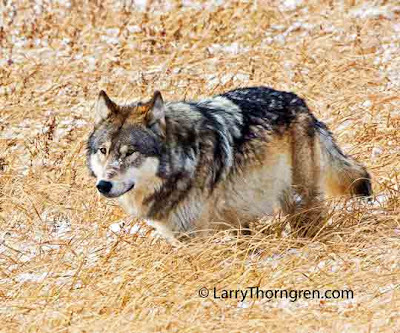 I photographed this wolf last October in Yellowstone. It was attracted to the area by a road-killed elk. Wolves will scavenge carcasses when the opportunity arises and have been known to take kills away from cougars. In Yellowstone, Grizzlies often chase wolves away from their kills. I was careful to watch for grizzlies while photographing this wolf and others in the pack. I like this wolf photograph as i has good personality and photograph is also fantastic.I like you have given its information about this photograph.A photographer should always be careful for wildlife photography.